House of Cards' fifth season is its darkest, wildest yet, though not quite as irresistibly binge-able as the first two. The twisty-turny, topsy-turvy circus that is the Trump presidency makes for arguably some of the most compelling television to be found on any given network. The colossal messes the current leader of the free world seems to be making on a daily basis (and the bumbling attempts by his constituents to clean them up) have been leaving people’s jaws on the floor across the country since the orange oaf took office. Perhaps one of the most terrifying, befuddling pieces of footage made the media rounds and set the internet on fire when Trump and the only slightly less controversial Bill O’Reilly shared an on-camera conversation in which the President intimated that, like Vladimir Putin, a known “killer” (O’Reilly’s word), some people in US Government were no less innocent. Even O’Reilly, a walking lightning rod himself, sat there stunned and speechless. What’s typically a blessing for a show like House of Cards has now, during this administration, become a curse. Political dramas depend on real political events as points of inspiration to provide relevant political and sociopolitical commentary, but now, the endless succession of controversies and calamities happening in the real world are actually more cartoonish and wacky than anything a prestige show like House of Cards could attempt to tackle. In essence, the team behind the fifth season of House of Cards had the unenviable obligation of commenting on a current political reality whose spectacle is far stranger than fiction and too stupid to fit snugly within the confines of a slickly produced political drama. That being said, the latest season of House of Cards still manages to be one of the series’ darkest and most intense, despite Kevin Spacey’s POTUS, Frank Underwood – a killer – somehow being far less terrifying and fascinating than his blowhard real-life counterpart. We begin where season 4 left off, with President Underwood in the midst of a re-election campaign, his ever-formidable wife, Claire (Robin Wright), at his side. The biggest obstruction on the road to a second term is Frank’s sordid past, which is dangerously close to being exposed for the world to see amid a maelstrom of controversies and accusations. Cunning and savvy as ever, the Underwoods kick up their own maelstrom of fear and confusion as a distraction, all revolving around an ISIS stand-in terrorist group called ICO. With the deftness and finesse of an orchestra conductor, Frank, Claire, and their cohorts “control the conversation.” “It’s terrifying, isn’t it?” Claire says in a carefully worded public announcement, warning of a “noisy press that’s choosing to dwell on the past instead of what’s happening right now.” The Underwoods propose a travel ban and have thousands of protesters clamoring at the White House gates as they plot how to win the election while somehow simultaneously brushing Frank’s prior transgressions under the rug. Show creator Beau Willimon’s departure from the series doesn’t have a noticeable impact on House of Cards‘ quality or tone, with new showrunners Melissa James Gibson and Frank Pugliese keeping the edges sharp and voices consistent. Meanwhile, Spacey is as refined and captivating as ever as the show’s puppet-master protagonist. An early scene sees Frank crash Congress, taking an uninvited march toward the podium where he loudly, bull-headedly demands that the US declares war. The scenario is outrageous, though as Spacey rants and raves (“I will not cease! I will NEVER cease!”) and adopts a distinctly Trumpian bark, the unprecedented, raucous disruption suddenly begins to feel quite plausible. Standing tall on the other side of the aisle as Frank’s campaign opponent is Republican war hero Will Conway (Joel Kinnaman, fantastic). His good looks give him an edge over Frank in the heated race, though his composure leaves much to be desired (he’s got some skeletons in his closet himself). As has always been the case with the series, it’s a wicked delight to watch the villainous Underwoods dodge, deceive, manipulate, and backstab their way through their thorny political landscape, always taking time to reflect on their dirty work with a self-satisfied smirk. Frank’s right-hand, Doug Stamper (Michael Kelly, who continues to be one of the series’ greatest boons) continues to carry out his dastardly dealings with cool confidence, while Claire’s go-to, Leann Harvey (Neve Campbell), handles backroom business in her own way. 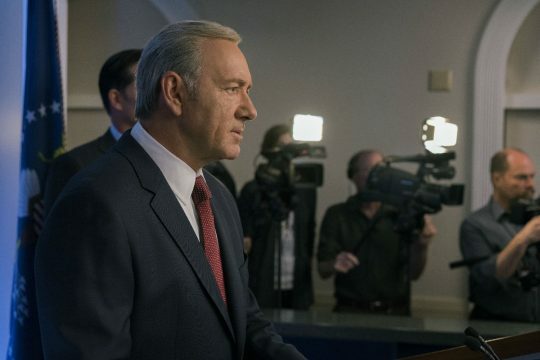 While not as irresistibly binge-able as the series’ first two seasons, House of Cards season 5 stands on its own as the most out-there, absurdist season of all, largely due to the influence of real-life political events. It feels as though the show was forced to push the boundaries of silliness in certain ways to match the outlandishness of our current political reality, which doesn’t always yield the most believable of narratives (Claire being Frank’s running mate, for instance, is ridiculous), but makes for a wild, wholly watchable political thriller that still stands as some of the most polished programming to be found on any streaming service.